Discussion in 'Miscellaneous' started by Miss Chicken, Jun 13, 2018. Her bookshelves - there are many similar videos on YouTube. I went looking for ideas I could impliment on making my shelves look better and was disappointed to find only these sorts of ideas. Any ideas on how to make my bookcases look tidier? 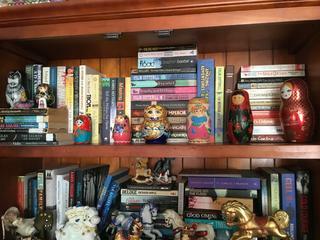 Please post pictures of your shelves as well. Scribble, cosmic mouse and GNDN18 like this. I think yours look fine just the way they are. Scribble, May 20 and GNDN18 like this. 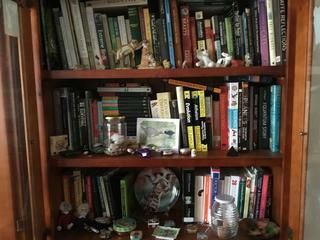 However I have tidied up one of the top shelves a little. I took size into account so they are in less alphabetical order than they were but still it should be easy for me to find a book. One shelf down, 24 shelves left to do. And I bought both cheap as Kindle books. I only own three of the Hitchhikers books so I will buy the 5 in 1 volume and get rid of my old copies. Scribble and GNDN18 like this. I am not a fan of that white minimalism in the video lol. I have waaay too many bookshelves though, it would take forever to fill them. There are multiple built in book shelves in three rooms in the house and then one I already owned that's quite big that I moved here and don't really need. I'm getting rid of stuff all the time. If I moved I bet I would be taking very little of it with me. I wish I had built in bookshelves in three rooms. As far as videos went - I gave up watching them after the third one that made the suggestion to arrange books by colour. I would never remember where a book was if I did that. The disadvantage of all these bookshelves is that those walls are hard to put furniture against and impossible to hang pictures on. Two of them take up two entire walls, two others take up 3/4 of the walls and one of them takes up half a wall. After my massive "I am now a minimalist" cleanout there's a lot of empty space though and I don't intend to keep collecting books. I have like 300 star trek books, I'd like to give them all away except some relaunch and now hard to get ones like A Stitch in Time. All I'd keep is those, my art books, my collection of translated korean fiction which also takes some hunting for and my Bab 5 trilogies. The rest of it, all those GoT tomes and random fantasy novels and the non-fiction reference books that are useless in the age of the Internet can GO. I have about 1100 printed books and about another 1500 Kindle/audiobooks. I think I have finally lost it. I am in bed reading a book and needed to go to the loo. I pressed on the screen to pause the book and there was no pause button. Then I realised I was reading a Kindle book not listening to an audiobook. I am not a fan of that white minimalism in the video lol. I'm not sure I'd call that minimalism. I've seen some home deco pictures where each shelf had only one item each. I'd love wall to wall bookshelves with which I can rebuild my library. 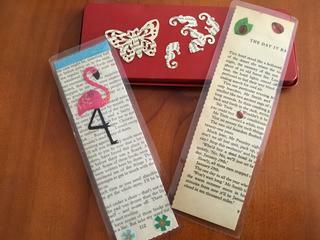 I have made a couple of bookmarks from the pages of the books I pulled from my collection. I also have been using my punches on them. I will keep the left over scraps for paper mache. Timewalker, May 20 and teacake like this. I haven't watched the video, but just based on the preview I have to say: there's something missing from those bookshelves. Hm, what could it be... oh, I know! BOOKS! 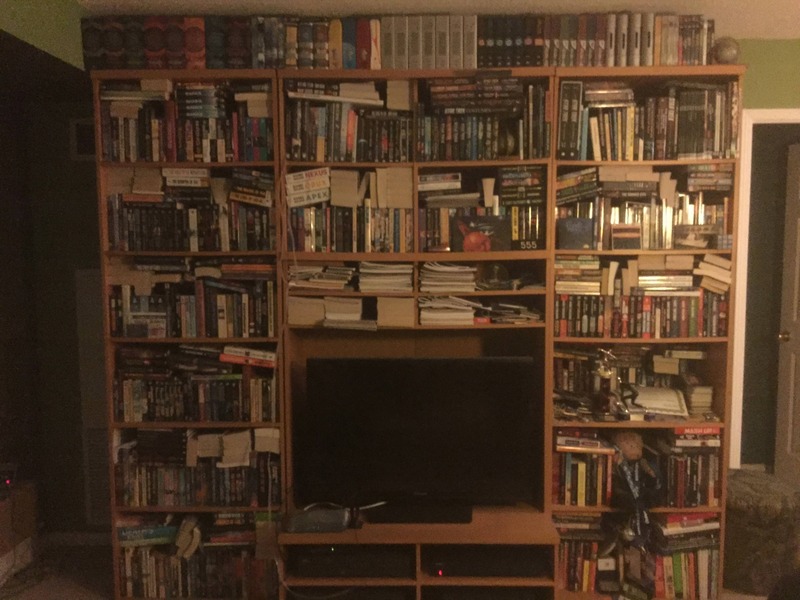 This is the bookcase in my living room - I have more in each of the bedrooms, plus about 50 books on the dining room table that I haven't shelved due to lack of space. I took this last October - I've bought a few more since then. Each of the shelves in this photo has two rows of books, and a few have three. cosmic mouse, May 20, TrickyDickie and 5 others like this. I have a mixture of Fantasy, Star Wars, Zombie fiction, World War 2 History books along with books by Richard Dawkins, Christopher Hitchens, George Freidman and Niall Ferguson among others. I also got the Tanakh, Gita, Dhammapada, Catholic Bible, Koran, Wycliffe Bible and the New Testament translated by William Tyndale in my book collections. And 20 plus books in my Gravure Idol collections, dating from the 80s and 90s, specially imported from Japan. All collector items. 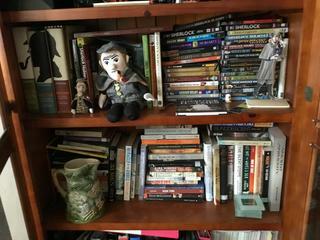 My non-fiction section is mainly mysteries and sci-fiction with a smattering of books in other genres. *Australian history especially the first few years of white settlement and Tasmanian history. I have a Sherlock collection - including the New annotated Sherlock Holmes which is a 3 volume set and is the 4 novels and the 56 short stories. I also have quite a few Sherlock novels written by other authors plus many DVDs including TV series, movies and documentaries. All up about 1100 books, plus another 900+ audio books and 600 Kindle books. May 20 and teacake like this. I have 2 glass-front bookcases in the family room, one 3-tiered bookcase in my bedroom, 2 bookcases in my sewing room, and one broken bookcase in the guest bedroom....PLUS books stacked on dressers, end tables, and basically most flat surfaces in my 2-story house. I also have 2 Kindles stuffed with nearly 1000 books. And I just bought more books. rhubarbodendron, GNDN18 and Miss Chicken like this. Tora Ziyal, cosmic mouse, USS Firefly and 3 others like this. I have the Ikea "Ivar" shelves and since I have such a terrible lot of books I keep them in boxes. These are simple cardboard boxes that I laquered in different colours, depending on the topic of their contents. It saves space and the books don't get dusty. Unfortunately my camera broke so that I can't post a pic. Interesting! Please post a picture when you can. LOL I have the opposite prob: I always try to turn the page when reading an ebook. I actually like the way your shelves look with both the books and other items on them. Not that your shelves are "messy" really, but I like the lovingly used look of a full bookcase. Since you asked though, if you pull out the books so that all the spines align (which means varying space behind different sized books and also removing the nick nacks) it will automatically look somewhat neater. 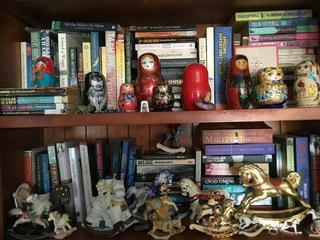 I love looking at others ' pics of their bookshelves. If I was at home I'd snap a pic of my own. Timewalker, May 20 and GNDN18 like this. Late 2004. These first 3 photos are of a book case that I built for all of the Trek books and magazines that I had at the time. No back on this one, but I used some 1970s Trek bed sheets to make the curtains. Lower shelves have cloth on them that is in a bit of a green jungle motif. 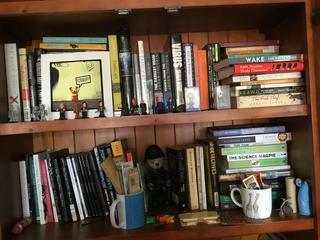 If you look closely, you can just make out the unauthorized book 'The Reckoning'. cosmic mouse, CorporalCaptain, Timewalker and 4 others like this.